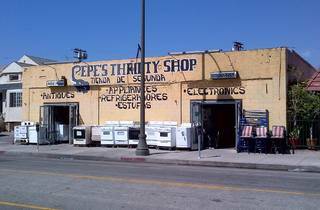 Pepe’s is one of those under-the-radar places in LA that people like to keep to themselves so others don’t go in and raid it of its treasures. Antiques here are priced incredibly reasonably, and you’ll find trendy mid-century pieces for hundreds less than they would cost elsewhere in LA. It’s a packed space, so seeking out the gems takes both time and patience, but it’s also a family-run affair and at least a few members are on hand at all times to offer advice. Most pieces are well-worn, so if you’re looking for antiques that have the appearance of being untouched or restored, this may not be the perfect fit. Those who prefer a homier vibe, however, will feel right at—well—home.